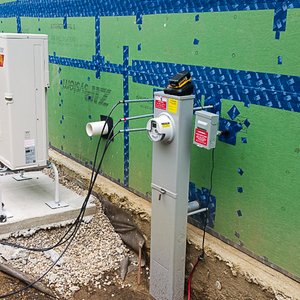 Small but important: The RenewAire energy-recovery ventilator is the heart of the Airport House's ventilation system, capturing some moisture as well as heat from incoming and outgoing air streams. It's mounted on the shop ceiling. Image Credit: Reid Baldwin Most of the ductwork from the bathrooms to the RenewAire ERV is 6-inch round or oval. The system draws air from the four bathrooms in the house and introduces fresh air to the return duct of the HVAC system. The air outlet and inlet for the ERV are located under the balcony at the back of the house. They must be separated by at least 10 feet. The other outlet near the ERV exhaust is the dryer vent. Editor’s note: This is one of a series of guest blogs by Reid Baldwin about the construction of his house in Linden, Michigan. For a list of previous blog posts on GBA by Reid Baldwin, see the “Related Articles” sidebar below. You can read his entire blog here. Installing the ventilation system caused a delay of several weeks. For reasons I will discuss below, I insisted on a RenewAire energy recovery ventilator (ERV). Since the HVAC contractor doesn’t handle RenewAire, he asked me to procure the unit. Well before it was required, I found an online retailer that advertised RenewAire, and I asked about delivery time. They replied that a unit would arrive about a week after the order was placed. I placed the order a couple weeks before it would be needed. After a couple weeks, I contacted the retailer to ask why it had not yet arrived. They said they had forwarded the order to RenewAire, which would ship it directly. After another week, I called RenewAire to learn the company had never received an order and that they’d had problems in the past with the retailer I’d used. I canceled the order and placed another through a retailer that was recommended by RenewAire. But just as the unit arrived, the weather turned hot. The HVAC contractor spent the next week responding to service calls from people whose air conditioners weren’t working. Finally, three weeks after finishing the rest of the HVAC rough-in, the contractor was able to return and rough-in the ventilation system. Rough electrical work was delayed until the ductwork for the ERV was completed (so that the ductwork would not need to be routed around wiring). 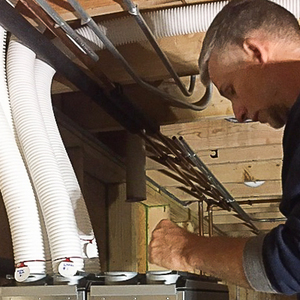 I am glad the work was done in that order because it was difficult to find a route for the ERV ductwork even without the wiring. 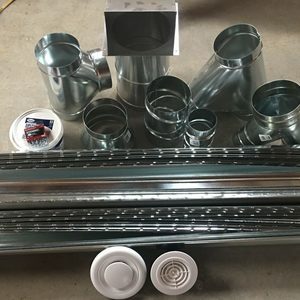 I downloaded the ERV installation instructions online and asked the HVAC contractor to do the ERV ductwork at the time of the other rough-in using these instructions. That would have prevented the delay from cascading and delaying the entire project. However, he was not willing to do that. Why do we need a ventilation system? 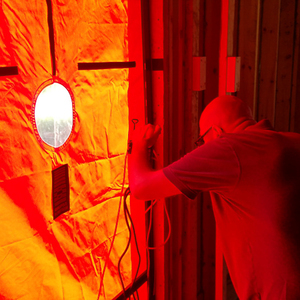 Building science professionals bristle at the old saying that houses need to breathe. However, they recognize the need for adequate ventilation and the need to avoid excessive ventilation. Occupant activities within a house, such a breathing, cooking, etc., produce various types of pollutants. A ventilation system exchanges the polluted indoor air for less polluted outdoor air. During much of the year, the incoming outdoor air must be conditioned, which increases heating and cooling loads, so over-ventilating is a problem. Traditionally, houses had enough random leaks to provide adequate ventilation. Even with a leaky house, some force must push air through the holes. In winter, a force called the stack effect tends to pull outdoor air into the house through holes and gaps near the bottom of the building, and expel it through holes near the top of the building. In summer, the stack effect reverses. Also, wind causes pressure differences around the house that pull air in through some holes and out through others. Unfortunately, cold, hot, or windy weather does not necessarily occur at the times when ventilation is needed. For a typical new construction house, the result is excessive ventilation sometimes and insufficient ventilation at other times. For a leaky house, like many older homes, the result is slightly excessive ventilation sometimes and way too much at other times. A mantra among building science professionals is “build tight and ventilate right.” The goal is to control the amount of ventilation, control the source of the indoor air that is expelled (since it is not equally polluted), and control where the incoming outdoor air is drawn from (since it is not equally fresh). There are various methods of providing forced ventilation in houses. Most houses have exhaust fans, such as bath fans or range hoods, to expel air during periodic activities that cause localized pollution. One method to ensure adequate ventilation, called exhaust-only ventilation, is to run a bath fan on a timer so that it runs a fraction of every hour. Outdoor air then flows in through whatever holes exist in the enclosure. This method provides control of the amount of ventilation and controls the source of air that is expelled, but it does not control what air comes in. Another method, called supply ventilation, is based on having the furnace fan draw in some outside air through a dedicated duct. This provides control of where the fresh air comes from. With a damper and appropriate controls, it also provides control of the amount of ventilation. Air leaves through whatever holes there are in the building. This is the type of system that the HVAC contractor proposed, although he did not plan to install the damper and controls. The third type of ventilation system is a balanced ventilation system. One fan brings air in through a dedicated duct while another fan expels the same quantity of air through another dedicated duct. This approach provides control of the quantity, the source of the fresh air, and the source of the expelled air. Additionally, there is an opportunity to run the incoming and outgoing airstreams through a heat exchanger to precondition the incoming air. 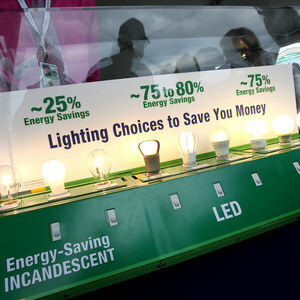 This reduces the heating and cooling energy use. Systems that exchange only heat are called heat recovery ventilators, or HRVs. Some systems also transfer humidity between the airstreams. These are called enthalpy recovery ventilators or ERVs. Since few people know what enthalpy is, some vendors call them energy recovery ventilators instead. The balance between price and efficiency fits my goals. RenewAire has been making ERVs for a long time. Its design does not require any special defrost modes. RenewAire supports using the ERV to replace bathroom fans. Experts disagree on exactly how to calculate the required amount of ventilation. Several formulas are available. The highest quantity using any of these formulas for our house is about 125 cubic feet per minute (cfm), so I wanted a unit that would provide at least that much. When replacing bathroom fans, RenewAire recommends at least 50 cfm per bathroom. Since we have four bathrooms, I initially selected the EV200. However, when I changed retailers, I was told the EV130 would ship about a week sooner than the EV200, so I changed plans and decided to replace only some of the bath fans. RenewAire supports several different ducting arrangements. I elected to draw air from three of the four bathrooms and supply fresh air to the return air ductwork. (The bathroom without a shower doesn’t need a full 50 cfm). A control next to the thermostat sets the percentage of each hour that the ERV will run. A control in each of the bathrooms forces the ERV to run in circumstances in which a bathroom fan would be operated. Now that you have lived with it for a while, how do you feel about having the ERV provide bathroom exhaust instead of a dedicated fan? In previous houses that had bathroom fans, we hardly ever used them. With the ERV, we hardly ever use the switch in the bathroom. Maybe my family is not the best for an insightful comparison. With this setup, the bathroom is ventilated at least part of the time without doing anything, so I guess it is an improvement. We have lived in the house since late September, so we have not yet experienced the time of year when excessive humidity is an issue. Any humidity in the bathroom after a shower dissipates quickly once you open the door. Stephen Sheehy used the same strategy and seems satisfied with it. I think his ventilation system runs continuously at a set rate but can be boosted if desired. With your system running for a set time each hour, I wondered if that affected its effectiveness in removing humidity and doors in the bathrooms, but it seems it isn't an issue for you. After your experience with delays you can probably understand why most mass-market builders almost invariably only use materials that are available at local lumberyards or suppliers. 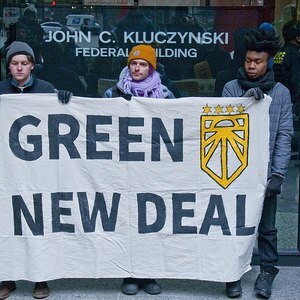 Hopefully as ERVs and other specialized materials associated with high performance houses become more common, improved supply chains will make delays less frequent. If I have any complaint about the placement of our stale air vents, it is the effectiveness for rooms other than the bathrooms. We have only one stale air vent on the main floor, and it is in a bathroom that is relatively distant from the family room and kitchen. (one is in the master bathroom upstairs and the third is in a basement bathroom.) I have a CO2 meter in the family room. When we have more than 3 or 4 people in the family room, the CO2 level creeps up even with the ERV set to 100%. As far as mass market builders and building supply businesses, it works both ways. Supply businesses will stock whatever mass market builders use. Ordering from an online retailer would work fine for a custom builder that used the same thing in every house they build. They would know when to order it and their HVAC contractor would know how to install it. My major frustration was the contractor's unwillingness to install the ductwork before the unit arrived. They had the installation instructions. Based on their unwillingness to work from instructions before the unit arrived, I shouldn't have been surprised that they didn't follow all of the instructions after the unit arrived. The ductwork has no dampers for balancing. I plan to add dampers to equalize the inflow and outflow. That ductwork is accessible. Fortunately, the balance among the three stale air vents is ok. (At least it passes the toilet paper test in each bathroom. I haven't measured the flow rates.) I don't know what I would do to correct that if I had to. How is the noise level of the unit? I have a small EV-90 renewaire in my apt that is fairly noisy and runs continuously. I'm happy with the ventilation but unhappy with the noise. Well written Reid. I've lived in my passive house for over 5 years now, and exhaust from 2 bathrooms and the kitchen continuously with my ERV. I have measured humidity, CO2, radon, and formaldehyde... humidity and CO2 continuously. All have been and continue to be quite acceptable. My ERV is independently ducted.. supplies are direct to bedrooms and living room. Sorry for your acquisition trouble... but you are correct- its a supply and demand thing (yes- i am an ERV manufacturer- 15+ years). We chose the RenewAire EV200 for our new house about 6 years ago. No problem ordering on-line. I highly recommend a sealed crawlspace design for this kind of thing: All our intakes are in the bathrooms which are scattered around the house and doing this in an attic would have been a nightmare (because of the need for insulation, but we don't even *have* an attic because the ceilings are bamboo flooring directly attached to the bottom of the SIP roof panels). We're in Boulder and put in a 40' 6" earth tube buried only about 4' down to take the freeze off incoming air (design temp is 0 F, with records around -25F). We disconnect it in the summer to prevent condensation (house is cooled with 2 evaporative coolers, which are also in that nice big crawlspace and run their outputs into it). 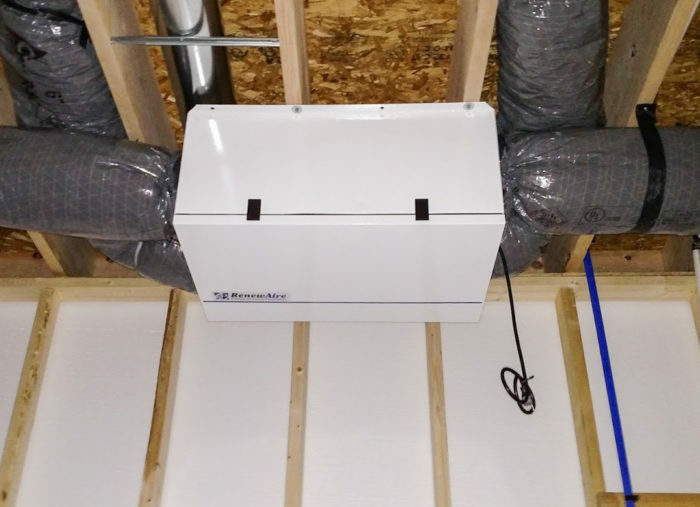 Another bonus: ERV dumps incoming air into the crawlspace, so the cool air that comes in when running the 900 CFM range hood doesn't bother anyone. Holes ("vents") in the floor bring the air up into each bedroom across from its bathroom (they're also the swamp cooler room inlets). 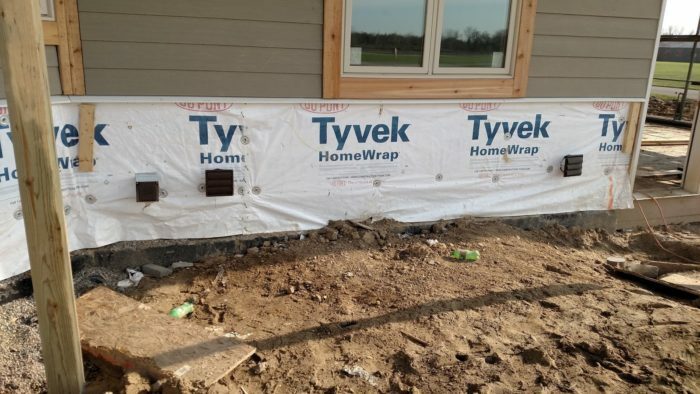 I also highly recommend Tu-Tuff over squeegee (coarse sand) for the crawlspace floor : We use that space for storage and so have been walking on it for years with no visible breakdown. You can get away with that in Boulder, but not everywhere. Boulder's low summertime outdoor dew points don't present much of a condensation/mold problem for earth tubes, but on the right half of the US map keeping earth tube air healthy enough for human consumption can be a challenge. It would have to be designed and managed much more carefully in Reid's Linden, MI location than in Boulder, due to summertime outdoor dew point temperatures well in excess of the subsoil temperature. We also have a 2 stage ERV, in mountain Utah. It works well. Extraction from bathrooms, and fresh air into HVAC return ducts. In winter, we have it on continuous low mode, with buttons/timer in bathrooms to boost to high for 20 mins or so when needed. In summer it is off, except when button is pushed, because we use natural ventilation - otherwise known as open windows. After 6 years in the house, the only glitch was in the first really cold winter, when we discovered that the inlet/discharge ductwork was not insulated -> frozen pipes!. That was fixed, and dampers added at the vents to the outside. We close these and switch off system when temperatures go down below zero F, which is usually for a few days each winter. Remember to put bug screens on the vents to outside, and clean them a couple of times per year. If you haven't seen it yet, you might want to read this article: HRV or ERV? First off, I've enjoyed this series because I'm in Michigan as well and it's interesting to hear about a project close to home. Second, It's a small thing, but those outer black plastic rings where the ducts attach to the ERV are for attaching the insulation jacket, so that a full depth of insulation is maintained right up against the unit to prevent condensation. It seems like nobody gets this right. I've been working with a contractor up here for a year and still can't get them to do it consistently, even though the units they're installing come with rubber straps especially for the job. They just leave them there next to the unopened install manual. Also, I'm currently arguing for continuous, occupant independent ventilation. Most people are like you and if there's a switch nobody turns it on, even in kitchens. Until someone beats me to building a quiet range hood that comes on automatically with the cooktop/oven (that everyone can afford), I'd rather see the whole room vented continuously and it might as well be through a ERV or HRV. Although I don't often use the bathroom override control, I do manipulate the percentage time control regularly. I suspect that I am unusual in that regard. I have a CO2 meter that I use as a guide. I change the runtime percentage based on how many people are in the house. I also turn it to the lowest setting when we open the windows on a nice day. If I were building a house for a normal person, I would prefer not needing anyone to manipulate the controls. A fixed setting would likely result in over-ventilation much of the time and under-ventilation when the house is full of guests. Giving an uneducated or unconcerned occupant control probably would result in worse errors. EV130 only got half the core of the EV200, kinda stupid if you ask me. RenewAire needs to step up their game. Andy Kosick, I like the way you think. Thanks for sharing your thoughts. I will be building in the Sacramento CA area. It's dry. Would I want to use an HRV or an ERV? Based on what you say about ERVs removing humidity, I'm thinking I would not need that feature. Addendum: Martin, thanks for that link. Very extensive and informative info. I think I'll go ahead with an ERV since my square footage is going to be rather small (approx 1400-1500). Thanks. You mentioned "supply fresh air to the return air ductwork". Is your air conditioning system running continuously in humid months, If not, wouldn't this cause condensation inside your ducts? Or is your duct work all insulated? No, I don't run the air conditioning system continuously. My ductwork is not insulated but it is entirely in the conditioned space. Can you please explain the scenario in which this would lead to condensation in the ducts. 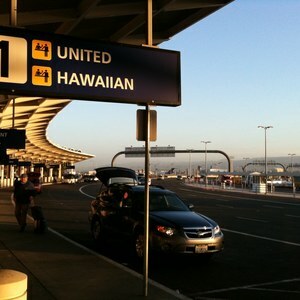 Reid, I was thinking of the scenario where your indoor air is colder than the fresh air that has come in thru the ERV. I was wondering if your ERV transfers enough moisture to stale air stream for condensation to not occur. If the indoor air (and thus duct walls) were colder than the outside dewpoint, then there would be a condensation concern. It is the outdoor dewpoint that matters, not the outdoor temperature. That is less likely than indoor dewpoint exceeding outdoor temperature in the winter. If the situation does occur, transferring moisture would help. I don't think that supplying the fresh air to return ductwork makes it any worse than dedicated ventilation ductwork. During the times that the air conditioner is running, it will be a little bit more effective at removing moisture due to the slightly higher moisture content in the return ducts.. Thanks for the info, Reid. At least in my home, the return ducts are a combination of joist/stud spaces sealed with cardboard-like material and metal. Only the supply ducts are metal for branches and insulated flexible ducts to the registers. If condensation would ever occur inside of the joist/stud spaces, we know it could be very costly health/wealth-wise. 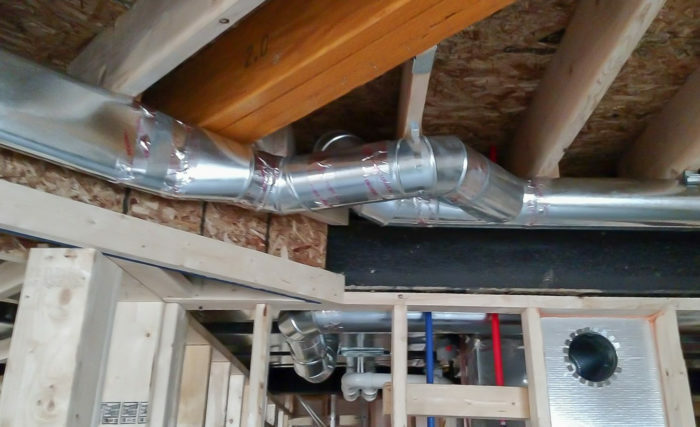 Perhaps in your case the return ducts don't use joists and studs as elements, in which case, I see it won't make any difference, whether the air is routed thru dedicated ductwork or the return "ductwork". Thanks.